Card counting is a strategy players use to remove the house edge from the game of Blackjack. In basic terms the player will track the ratio of high to low cards by concentrating on the cards that are flying out of the Blackjack shoe. Bear in mind that unlike in online Blackjack your every move is watched by the casino – they look out for card counters so always remember there is always a risk of being thrown out if you get caught! So why is the ratio of low to high cards so important? Players want to see high cards being dealt to them and the low cards going to the Dealer. As a Blackjack hand will pay out 3:2 it is this particular hand that you are searching for. The more tens or aces that you are dealt increase the likelihood that you will hit this specific hand. 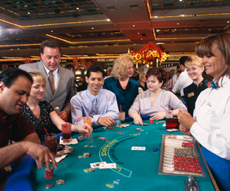 There are many variations of card counting. Here is a strategy known as the Hi-Lo system. Card counters assign a positive, negative or nil value to every card in the deck(s). So if the card counter sees a card between the values of 2-6 they add one point to their running count. Cards ranging between 7-9 are ignored or assigned a nil value. Any ten or ace noticed by the counter subtracts one point from the running score. In basic terms (it can get very complicated!) the card counters bets should increase in line with their running count. The higher the count the more they should bet and vice versa. A card counter deploying such a strategy can have a one percent edge over the casino. This gave rise to teams of card counters who first came to prominence in the 1970’s. It is documented that some of these teams made millions deploying various card counting strategies and quickly became enemies of the house. If you do find yourself on the wrong side of a casino owner then online games might be a safer option! How to Win at Blackjack using a Winning System.